With an impressively low 990g weight and unique leaf spring suspension, the Lauf Trail Racer fork combines the best of both a rigid and suspension fork. The Lauf Trail Racer fork is Lauf’s longest-tenured fork, and for good reason. It’s history goes all the way back to 2013. 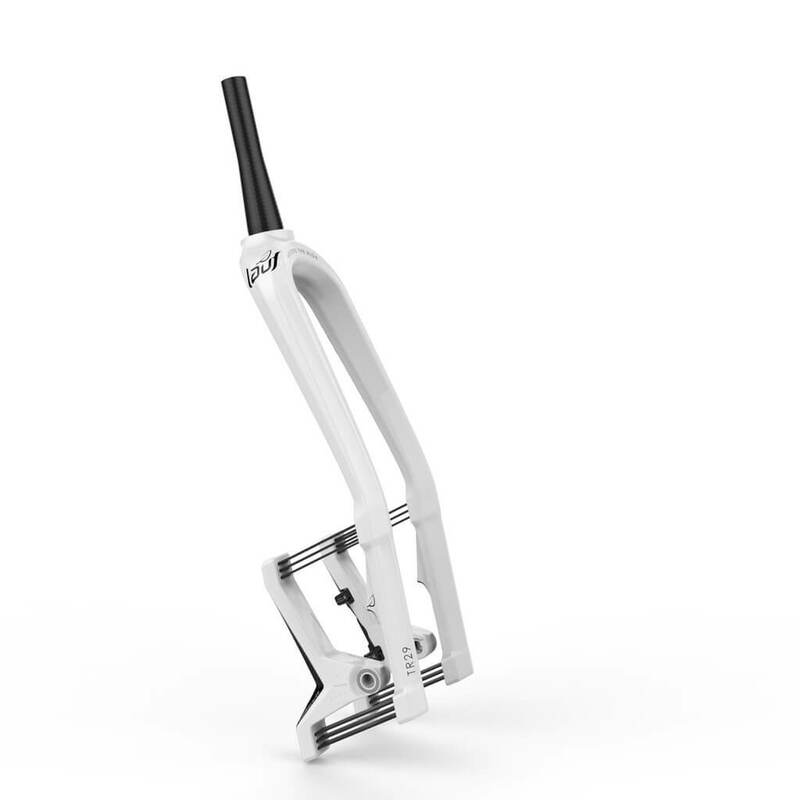 In the very first race the Lauf Trail Racer fork entered, Helgi Berg took 1st place. The contest took place on the tracks of Heidmork, a popular outdoors area at the border of Reykjavik, Iceland, their home turf. Close to 100 people entered the race. The Lauf Trail Racer fork is based around the Lauf Spring System (LSS), tuned for 30mm of travel (after 6mm of sag from the rider). LSS is a series of twelve undamped composite leaf springs bonded between a carbon fiber fork and 12mm or 15mm thru-axle dropout they call the Springer. Each stack of leaf springs – called a Springstack – is bonded via an Integrated Spring Pocket into the fork and Springer. All in, this technology-packed fork comes in at a lithe 990 grams. 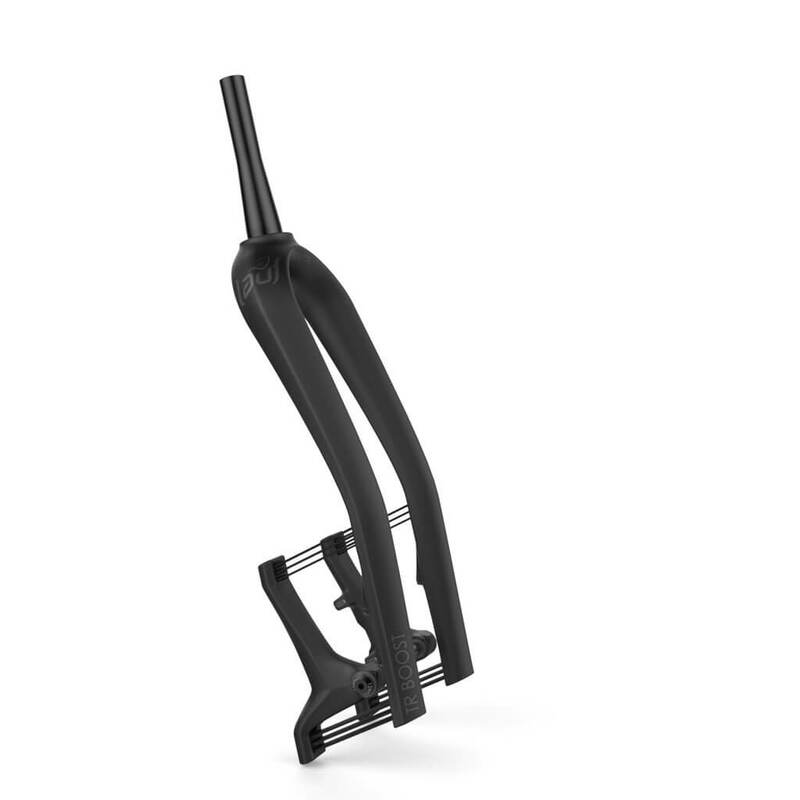 While this is about a half pound to one pound heavier than a high-quality carbon disc fork, it is at least a pound lighter than a typical suspension fork. 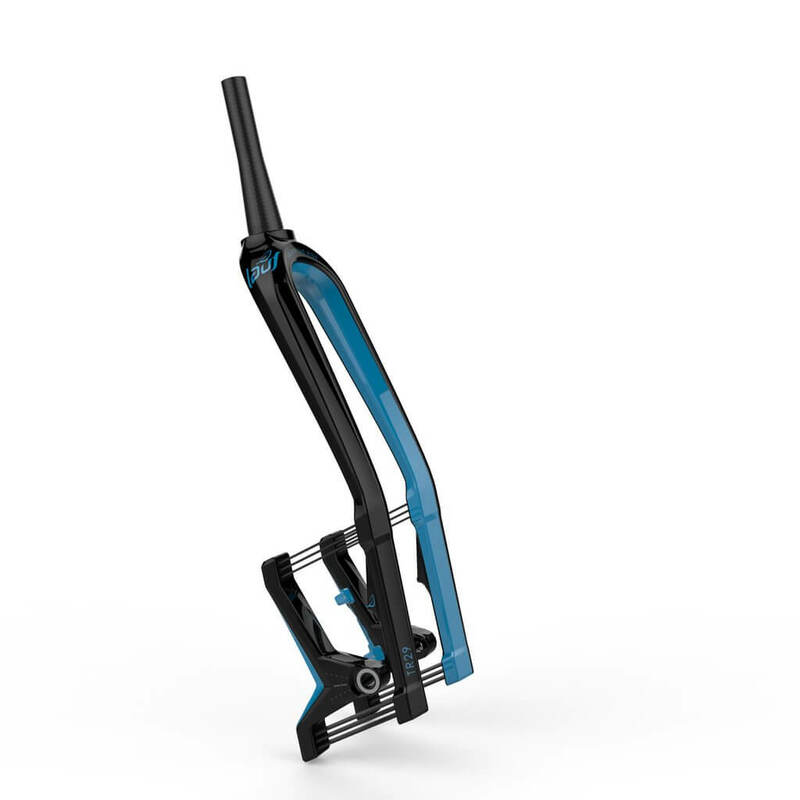 A major positive of this design is that the Lauf is absolutely zero-maintenance. Compared to a well-used suspension fork, there are no fork rebuilds and no leaky seals. Another upside is that there’s zero friction which makes the fork energy efficient, and the lack of seals and moving parts means these forks work in extreme conditions of heat and cold. These forks offer progressive compression, meaning each Springstack stiffens up as they go through the fork’s travel. This helps keeping the fork from bottoming out without sacrificing small and medium bump compliance. How does it do on the trail? With an impressively low 260 grams of unsprung weight, the Lauf Trail Racer does an excellent job of absorbing small bumps. It feels like a good rigid carbon fork when climbing, with little loss from bobbing. Over bigger bumps, it’s inherent springiness starts to come out; this fork should be treated more like a rigid fork with added compliance than an outright suspension fork. Adjust your expectations, however, and the fork is an excellent choice over the kind of terrain a cross country mountain bike is designed fork. The Lauf TR275, priced at $790, is designed for 27.5 inch wheels and a 15 x 100mm hub. It comes in Naked Matte, Naked Glossy, Carbon / Red, Carbon / White, Carbon / Orange, Carbon / Blue, Carbon / Green, Full White, and Full Red colorways. The Lauf TR29, priced at $790, is designed for 29 inch wheels and a 15 x 100mm hub. It comes in Naked Matte, Naked Glossy, Carbon / Red, Carbon / White, Carbon / Orange, Carbon / Blue, Carbon / Green, Full White, and Full Red colorways. The TR Boost, ranging between $890-990 depending on color, is designed for 27.5 Plus or 29 inch wheels with Boost hub spacing. It comes in Carbon / Red, Carbon / White, Naked Matte, or Custom Pink Pantone 230, Custom Silver Metallic Pantone 877, Custom Bright Orange Pantone 021, and Custom Green Pantone 7488 colorways. Please note that these custom colors may require an additional 4-6 weeks to ship. Two spring rate options are available: Regular, for those weighing over 65 kg (143 lbs), and Light, for riders under 70 kg (154 lbs). The Trail Racer requires a minimum 180mm brake rotor.